The Napa Valley AVA (American Viticultural Area) is the most renowned AVA in the entire United States. It is one of the smallest and most diverse in the entire world! This truly spectacular region is home to excellent vineyards, delicious wines and a luxurious culture. The Paris Wine Tastings in 1976 helped Napa Valley make it’s way onto the world stage. It was then noted the premier quality of grapes and wine coming from the region. Now, Napa Valley is a major tourist destination, and is known for providing lavish treatments to the guests in the region. From to-die-for spa treatments to gourmet goods, you may never want to leave. There are multiple mountain ranges within the region. The Mayacamas Mountain Range is found at the Western and Northern side. The Eastern side brings you the Vaca Mountains. The elevation also ranges from sea level up to 2,600 feet. Although it’s true that the Napa Valley began producing wines in the 1800’s, there were some definite setbacks. The Phylloxera louse hit hard in the late 19th century through the beginning of the 20th century. This unfortunately killed off the majority of wines in the region. Next came prohibition. Prohibition was enacted in 1920, and led to the closing of most of the remaining wineries. (The few left open had agreed to only produce sacramental wine.) Those who kept their vines alive sold their grapes to local home winemakers. Of course, soon there after came the Great Depression. From here the wine business came almost to a complete stop. Luckily for us, Andre Tchelistcheff came to out aid in 1938 and established what is now know as modern day wine making in California. An outbreak of phylloxera was discovered among a certain varietal in 1983. Most winemakers took this as a time to switch varietals to ones more suited for the geography and climate. Three quarters of affected vineyards had been replanted with a resistant strain by the 1990’s. Curious to know what percentage of California grapes come from this famous area? Not a lot. In fact, only about 4% of California’s annual grape harvest comes out of Napa Valley. Multiply that number by .1 to get the number it represents on a worldwide scale at a minuscule .4%! How incredible is it that such a small amount of grapes could in turn become famous for creating incredible wines. Bordeaux has around 6 times that in vineyard acreage (around 270,000). Neighboring Sonoma has 6,000 acres of vineyards. Sonoma Coast AVA has around 517,000 acres. There are 12 recognized soil orders around the world. 6 soil orders can be found within Napa, as well as 33 different soil series. Soil composition is by far one of the most important factors in grape cultivation. The climate in Napa Valley is the dry Mediterranean Climate. The Mediterranean Climate only accounts for a mere 2% of the world’s climate. This ensures that the high on a summer day reaches about 80 degrees in the southern part of the valley and 95 degrees in the northern part of the valley. Overnight lows average around 53 degrees across the valley. Across the Napa Valley you will find elevation ranges from sea level all the way up to 2600 feet. As you continue your research of owning a vineyard you will find that the topography of the vineyard is a key factor in the grapes growth, as well as the length of the growing season. You will find 16 recognized AVAs within Napa Valley alone. WOW! Cabernet Sauvignon – This delightful grape accounts for almost half of all the grapes in Napa Valley! What is Napa Green? This is a comprehensive certification program that represents a soil-to-bottle approach to environmental protections and wine making. It is one of the most intense and comprehensive environmental accreditations in the industry. To ensure accreditation, wineries and vineyards must use holistic approaches throughout the process. It also ensures social and economic sustainability which means everything from caring for their workers to giving back to the community. The goal of the program is that all eligible members will qualify by the year 2020. There are around 700 grape growers within Napa county. 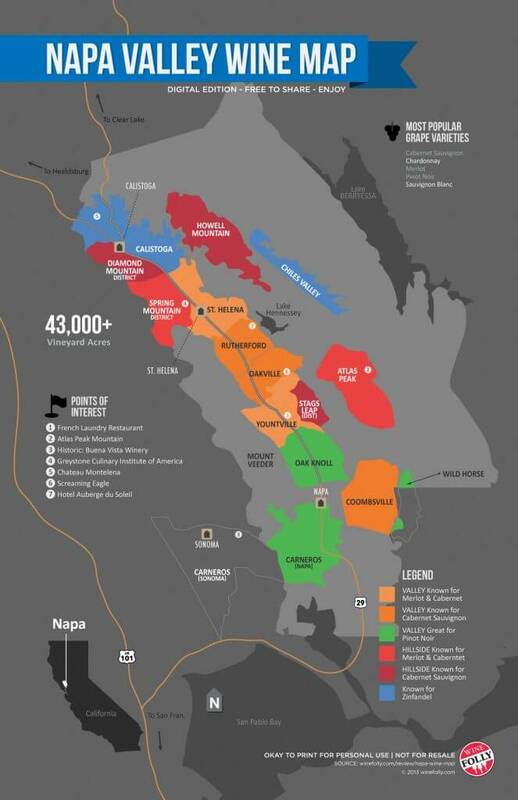 475 wineries are located in Napa County. These wineries produce 1000+ different brands of wine. 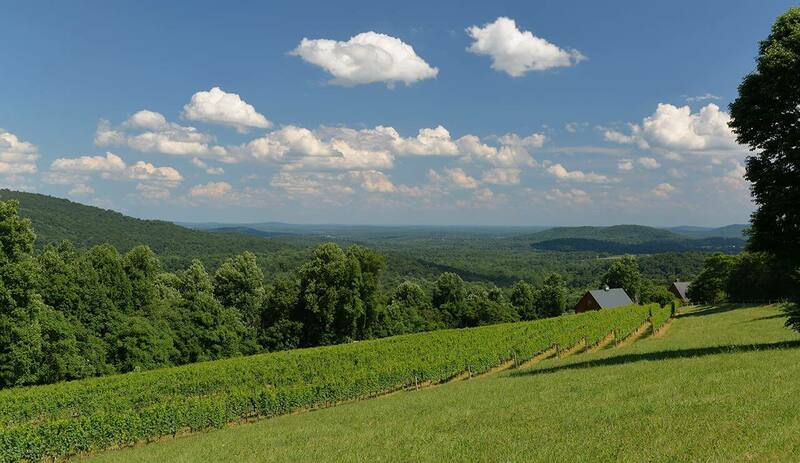 Family’s own approximately 95% of wineries in the region. There is certainly no shortage of entertainment in the Arts. The galleries will leave you speechless, whether they bring you local talent or have visiting artists. You can be sure you will find the latest cultural happenings here in the valley. There is even a Napa Valley Film Festival with 100+ new independent films! PS. Hot air balloons are a thing. A big thing. Take a ride across the Napa Valley up high in the open air and get a whiff of the natural beauty. From a night on the town to music festivals, you will find truth in all three of these: good food, good wine and good times! Visitors will find great wine and great food side by side in Napa Valley. We searched out some of the best just for you. This restaurant retains deep roots in San Francisco Bay area, but both chefs happen to be from Napa Valley. Here you will enjoy house made charcuterie that is simply to die for, and Neopolitan pizza that comes topped with fresh, local ingredients. Here you will find Asian inspired cuisine that is super wine friendly. Does glazed pork belly, and hamachi sashimi sound delicious? This may surely be your spot. There’s even a famous house Redd Wine, impeccably named. Around 30 years old, this restaurant famously brought world renowned cuisine to the already wine famous region. The perfect compliment of rustic and refined, you may have to call ahead for a table in this magnificent space. If you are looking to buy a winery in California, Napa Valley should easily make it to the top of your list. “Living the Life” is how I would describe making Napa Valley your home. The wine making might fulfill a lifelong dream, or a new found passion. The climate will greet you every morning with a gorgeous fog. The food and artisans, the farmers and locals, once meeting these amazing people that make Napa Valley what it is today, it’s likely you will never want to leave. 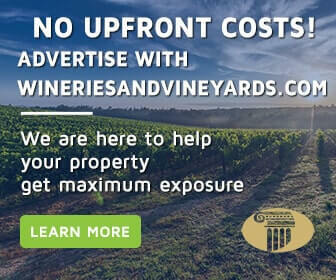 So please, do your due diligence, and look at all the places in California to purchase a winery for sale. Make sure though, to leave plenty of time to explore this world famous region. How long is the Napa Valley? 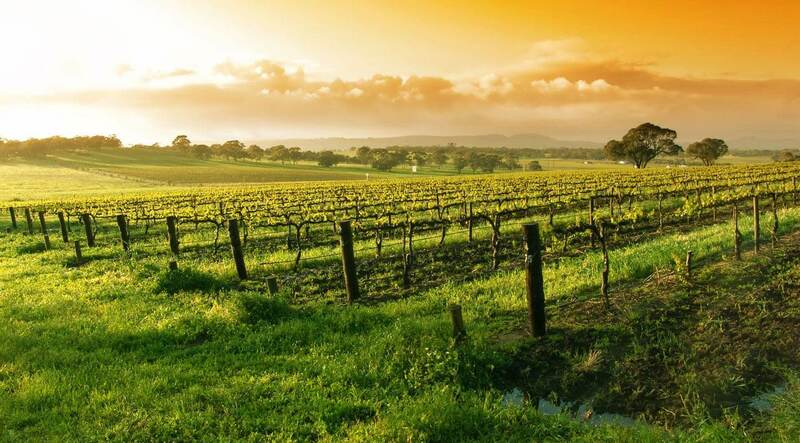 The Napa Valley is a slender region that measures only 30 miles in length and five miles across at it’s widest point. What kind of wine is the Napa Valley known for? The Napa Valley produces a range of reds that it is known for. The majority of wines are made from Cabernet Sauvignon as their base. They also widely use wines that are popular in France’s Bordeaux region: in addition to Cabernet Sauvignon these include Cabernet Franc, Merlot and the occasional Petit Verdot and Malbec. The three elite reds are: Opus One, Rubicon and Dominus – all made primarily from Cabernet Sauvignon. The Cabernet Sauvignon grapes account for nearly half of the vines planted in the region. Yes. Napa, California is the largest city in Napa County California. As of the 2010 census the population was around 80,000. What is the closest airport to Napa Valley? The Sacramento International Airport is about 60 miles east of Napa Valley. The San Francisco Airport, SFO, is approximately 55 miles, 2 hours, from Napa Valley. How much does a wine tasting cost in Napa Valley? A wine tasting costs between $15 and $25 in Napa Valley. Here is an index of the wine tasting fees in the region: Napa Valley Wine Tasting Fee Index. Whats the weather like in Napa Valley? You will find a pleasant temperature of right around 70 degrees year round. Between December and February there will be scattered showers, and often times is one of the most beautiful times to visit the Valley.